IronRock Insurance Company Limited (ROC), audited results for the year ended December 31, 2018 posted gross premium of $571.84 million relative $424.46 million; this represents a 35% increase. Change in gross provision for unearned premiums amounted to $42.11 million compared to $142.65 million in 2017. As a result, gross insurance premium revenue amounted to $529.73 million relative to $281.81 million in 2017, an 88% increase year over year. Net insurance premium revenue amounted to $184.22 million, relative to $78.01 million in 2017, following net unearned premium adjustment of $356.84 million (2017: $296.06 million). In addition, the company booked a net claims of $72.39 million relative to $46.83 in 2017 for the year. Commission expense totalled $60.02 million in contrast to 2017’s $31.46 million, while commission income grew by 97% from $33.63 million to total $66.31 million. Operating expenses for the year increased to $160.10 million relative to $134.74 million in the prior year. As such, underwriting loss improved over the year closing at $41.98 million versus a loss of $101.38 million in 2017. Investment income increased from $30.74 million to $32.22 million in 2018. Profit on sale of investment amounted to $3.16 million compared to $24.09 million in 2017. Foreign exchange gain amounted to $8.37 million compared to a FX loss of $1.31 million in 2017, while other income soared to $1 million (2017: nil). 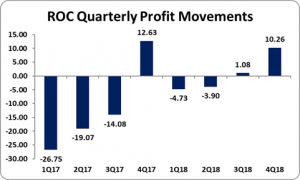 As a result, profit for the year totalled $2.77 million compared to a loss of $47.86 million in 2017 an improvement year over year. Earnings per share for the year totalled $0.013 (2017: LPS: $0.224). The numbers of shares used in the calculations are 214,000,000.00 units. The stock price as at March 29, 2019 was $3.99. As December 31, 2018, assets totalled $1.01 billion (2017: $937.77 million) increasing by a 8%. Investments contributed to this increase in the asset base by $153.98 million or 55% to close at $434.59 million (2017: $280.61 million). Shareholder’s equity closed at $514.71 million (2017: $512.34 million). This resulted in a book value per share of $2.41 (2017: $2.39).